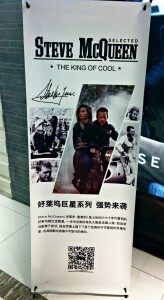 Day 138 in Beijing: Steve McQueen. The King of Cool. Honestly, it doesn’t matter where you are. Heck even in Beijing, everyone knows that Steve McQueen is The King of Cool. The man drove a Mustang through the streets of San Francisco. He lived his life his way.